Let's ignore for a moment that the handlers' orders are completely unrealistic (for example, not one of them ordered 47 to kill every human in the building and arrange their corpses into a giant phallus), this is a flawless piece of promotion. 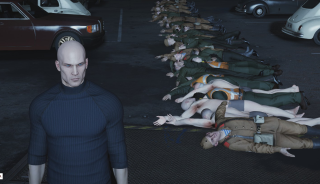 From the Devon mansion that reflects Hitman's opening level to the meticulous emulation of in-game camera angles, live-action Hitman looks like it would be great fun to play, if it weren't for all the hassle in setting it up. This budget-buster comes courtesy of Realm Pictures, the same production company that put together a real-life first-person shooter controlled over Chatroulette. It's provided a behind-the-scenes look at how everything came together, including voice of Agent 47 David Bateson's direct line to the players, which would be enough to make me hang up the phone and back away in terror. If you've got 22 mic'd-up actors and an AV desk to mix the feeds, then this is something you can do in your own free time. Otherwise, er, maybe Realm does parties?